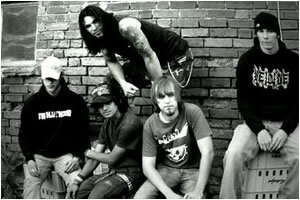 The group consists of 5 fiery metalists from middle England who came together in 2004 and soon gained a massive following and fan base thanks to there “explosive live performances” and “tight, aggressive, yet melodic metal sound”. Visit their Myspace page by clicking the link below! The lads (Darrin South on vocals, Craig Newell and Joe Garrett on guitars, bass player Josh Gurner and drummer Lee Newell) have asked Dave to play the 17th century blood thirsty villain “The Barber Of Fleet Street” other wise known as Sweeney Todd in their latest fast pace and hard hitting music video. The track Force Fed already has rave reviews being featured on the BBC Rock show and the Total Rock fans favourite play list. Its fans include the legendary producer Russ Russell who has offered to do a remix of the track for a special release. "The track rockets into action, we open on a close up of a blood-spattered hand gripping a chunk of raw meat. Energetic jump cuts show the morsel hacked, flipped and tenderised with venom. Dropped onto a tray it is thrown into an oven, its flames roar like the fires of hell. Slamming the door shut the meat races through various stages of cooking, it sweats blood, oozes juices and finally crisps up, at which point it is taken from the oven, garnished and carried off by a waiter into a restaurant adorned with ponsy black tie diners. From behind the kitchen door the chef (Dave Courtney) sneers, his eyes follow the plate with glee. Something isn’t right. The frenetic pace of the editing means we are still within the first 30 seconds of the track." "On the opening line we cut to the lead singer, revealing the ill matched entertainment for the evening, Sacred Mother Tongue, centre stage of the restaurant, which is occupied by pompous self flagellating gluttons. Shrouded in pools of light and shade their raucous energy blows the place apart. However, the diners seem oblivious." "The waiter, carrying the meat dish, passes in front of stage and we follow. Reaching a table he carefully places the food in front of a snobby diner. Without thanks the diner tucks in. On first taste it is clear the meat reaches parts other meats cannot." "What follows is an escalation of excess as we cut between the bands performance and the diners increasing obsession with the meat. The bands performance grows darker in conjunction with the diner’s descent into increasingly carnivorous actions. What is it about the meat that causes such frenzy? Aware of not wanting to commit any social faux pas the guests try unsuccessfully to restrain themselves as they devour the meat with less and less grace. As it progresses the occasional drop of blood trickles from the corner of their mouths, which they wipe with stained napkins. Seconds are ordered. The kitchen is busier than ever, carving, slicing and hacking." "Sacred Mother Tongues visceral performance has reached debauched levels, as too has the guests obsession for the meat. At about 3min 17sec the track slows. A diner wipes blood and juice from his mouth with as much dignity as he can muster. Excusing himself from the table he passes through the restaurant to the toilet. Standing at the urinal he stares vacantly forward. Suddenly an unseen assailant ambushes him, forcing a chloroform-laced cloth laced over his mouth. After an unsuccessful struggle he finally he loses consciousness. A series of jump cuts, his body dragged through a corridor by the feet into the kitchen and onto a silver surface. His body is marked with blue dotted lines as if prepared for plastic surgery. Finally his assailant is revealed, it is the chef (Dave Courtney). He wields a cleaver over the dead man sizing up the blue marked ‘cuts’. He swings, a flow of blood sprays up the wall. " "Cutting to an identical shot to the opening we realise the meat being carried in chefs bloody hands is that of the unfortunate diner. The singer commits his final roar as Marco cracks a sinister grin and watches through the kitchen window as the rich gorge on their own flesh, oblivious to being force-fed their own rumps.."
"The video is infused with dark energy juxtaposed with elements of tongue in cheek humour. Slick black and white tuxedos contrast the rich blood reds giving the video a slightly vampiric feel but with the class and style of American Psycho. The use of handheld camerawork and close ups of all the blood filled meat eating will add to the uneasiness of the whole video. Thick with atmosphere and sinister undertones we are offered a glimpse of what it might be like to attend a dinner party in hell." For those of you who don't know who Sweeney Todd is he was born in 1748 in the slums of Stepney, London and was the only child to 2 alcoholic silk mill workers. By the age age of 5 he was working from 6am till 8pm, 6 days a week in the same mill as his parents to earn extra money for their gin. When he was 12 London saw the coldest winter ever and many slum dwellers died as they couldn't afford heating or warm clothes. Sweeney's parents were no acceptation because they both died together after passing out in a gin joint and froze to death. 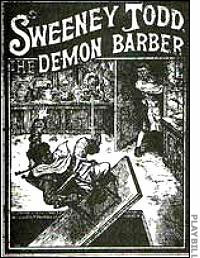 Sweeney was made a parish orphan and because there was no room in the work house he was sent to work as an apprentice for cutler John Crook's in High Holborn where he trained to make, repair and sharpen razor's and knifes. He was beaten daily, starved and slept on the floor at night and he wanted to escape but because he worked for room and board he had no money to pay for his life outside the shop so he decided to steal from there to make some cash to leave but he was caught and charged. Because of his young age he escaped the gallows and was sent to Newgate prison for 5 years, where he befriended the prison barber, also a convict, who agreed to train him in his trade. When he was released from prison at 19 he decided to set up a business as a travelling barber, plying his trade on London street corners. He also shacked up with a prostitute called Molly Elmin who he made promise to give up her street walking if he agreed to keep her. However, one day when working at Hyde Park a man asked Sweeney for his services and whilst he was going about his work the man mentioned the fact that he had enjoyed the services of Molly as a street walker the night before. Raged with jealousy Sweeney slashed the mans throat from ear to ear before doing a runner and managed to avoid capture. This murder gave him a taste for blood and in 1787 he leased a shop on the north side of Fleet Street between St Dunstans church and the Royal Courts of Justice. When setting up the shop he noticed that the abandoned crypts underneath St Dunstans run right underneath his shop and this gave him a great idea. He built himself a trap-door with a barbers chair fixed on each side so that when a person was sitting in the chair he could quickly slit their throat and then pull a leaver flipping the trap door all the way round, dropping the corpse to the floor in the crypt beneath and flipping the new barbers chair that was fixed on the reverse in place for the next victim. At the end of the day he would go down to the crypt and collect all their valuables up for selling before going home. Soon after starting this he became friendly with the widow women Margery Lovett who had been left the pie shop next door by her dead husband. They became lovers and moved in together. After a while Sweeney was faced with a problem, he had so many bodies down in the crypt that he couldn't get anymore in and so as a solution to this problem he let Margery in on his little hobby and asked her if she could cook the remains and put them in pies to sell in her shop. 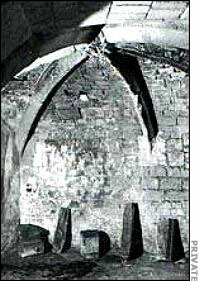 Margery readily agreed, happy to take the free meat that would make her money and so they set to work on her pie shop making a false wall in between her part of the crypt which also ran underneath her premises and his so that he could kill the victims, throw them through the trap-door then go down into the crypt, strip the body of all valuables and clothes, skin them, gut them and remove all the meat from the bones. Finally he would place all the useful meat and organs in boxes, push aside the fake wall and deposit them in Margery's half of the crypt putting the wall back afterwards. Margery would then cook the meat and put it in the pies for selling. Margery's "veal" and "pork" pies became very popular and in fact people both rich and poor would flock to her to buy some, queuing round the block to wait for 12pm every day when they would go up for sale. This went on for quite sometime until a foul smell began to fill St Dunstans Church. It was ignored for a while until it became so bad that the parishioners thought the church was disease ridden and so the authorities where called. A Mr Otton from The Bow Street Runners (predecessors of the police force) came to investigate with some of his men and a massive search for the smell was launched. As the men went down into the crypt which was a complete through tunnel underneath the church and all adjoining businesses (apart from Sweeney and Margery's false wall) the smell became worse and it soon became apparent why. 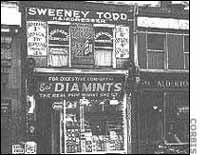 When they got underneath Sweeney's shop they found the blood, bones, skin and other human remains of over 160 people as well as the couples false wall. They decided to search the living quarters of Sweeney and Margery's living accommodation in secret before they made any arrests and when they did they found a treasure trove of items belonging to dozens of people who where currently reported missing. They arrested Sweeney and Margery straight away and they both came quietly. Sweeney made no comments at all but Margery confessed to the lot but she escaped the gallows by poisoning herself in December 1801it Newgate Prison. Sweeney Todd was put on trial for just one of his victims, sailor Francis Thornhill because the rest of his victims couldn't be identified. He was found guilty and hung in Newgate prison yard on January 25 1805.